The year 2018 was another big one for the SkyLaw team, and there are many more exciting developments to come in 2019. We are excited to be working on transactions in many diverse industries, including in our sweet spot of cross-border transactions. Our 2018 deals included the acquisition of a Canadian tech company by an Australian public company, a strategic joint venture between our medical device client and a global Chinese company, and several private placements in Canada by U.S.-based issuers. SkyLaw client Gotham Green Partners, LLC is an early mover in the cannabis industry. SkyLaw worked with Gotham Green to make several big investments in Canadian companies, including a US$50 million investment in iAnthus Capital Holdings Inc. (CNSX:IAN) and a US$32 million investment in Cannex Capital Holdings Inc. (CNSX:CNNX). For more information, check out our blog posts here and here or view the recent press release here. We started working on cannabis deals back in 2015 when we represented Pharmacan Capital, now Cronos Group Inc. (TSX:CRON), in its acquisition of Peace Naturals. We were delighted to work with Cronos on its precedent-setting listing on NASDAQ in 2018 and we congratulate the hard-working Cronos team on all of their achievements. For more info on the Cronos Group’s accomplishments, view our blog posts here and here. Andrea Hill’s cannabis blog What’s Up in Weed continued to generate high praise and attention from across North America in 2018. 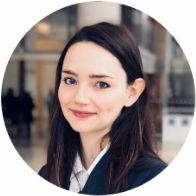 Recognized as one of Canada’s leading legal experts in corporate cannabis law, Andrea is sought out by cannabis-industry companies, their investors, Canadian and international media, and other lawyers around the world for her nuanced grasp of the fluctuating cannabis regulatory landscape, and her keen intuition about where the law is likely to go next for this billion-dollar industry. She works with a broad variety of clients in the cannabis space, including licensed producers, applicants, and ancillary businesses. Andrea is a frequent speaker to both business and legal audiences, and a repeat contributor by invitation to The Globe & Mail’s Report on Business and exclusive Cannabis Pro newsletter, where she analyzes changes to cannabis laws and their impact on businesses. October 17, 2018 was a big day in Canada as a new multi-billion dollar industry was created overnight. Canada’s move to end cannabis prohibition and create a whole new regulatory system with so many moving parts has kept us all busy. It is rare for there to be so much excitement about government regulations, but after Ontario released its regulations for its new cannabis dispensary regime on November 15, 2018, Andrea and Kevin worked through the night to get an opinion piece to The Globe and Mail that was published in the Saturday edition and created a lot of buzz. Check it out here. SkyLaw was thrilled to welcome Lisa Silver Slayter back to the firm in the summer of 2018. Lisa was SkyLaw’s first associate and was instrumental in the launch of “SkyLaw 2.5” back in 2015. Lisa has returned as the firm’s Managing Lawyer and is responsible for overseeing the firm’s practice. Lisa can be contacted by email at lisa.silver.slayter@skylaw.ca or by phone at 416-759-5299 ext. 104. 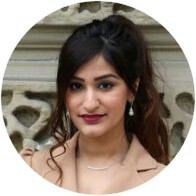 In July of 2018, Priya Ratti, a former SkyCounsel member, officially joined the SkyLaw team. Priya can be contacted by email at priya.ratti@skylaw.ca or by phone at 416-759-5299 ext. 106. A Look Ahead to 2019! We are so excited for all of the big things to come in 2019 for our booming enterprises! We have lots of clients in a wide variety of industries from manufacturing, technology, professional services, social enterprises and cannabis. We have some fun deals in the pipeline, including buy-side and sell-side private M&A transactions and a reverse take-over of a technology company client. We also have a number of new startups whom we are delighted to assist with setting up their legal structure for long term success, from incorporations to shareholder agreements to employee stock option plans and more. In addition, two of our current clients expect to receive licenses under the Cannabis Act very soon. We have also submitted a number of expressions of interest for the retail store lottery in Ontario and hope we have a winner! Another SkyLaw Baby on the Way! As some of you may know, SkyLaw’s Managing Director Jen Semple-Berger and her husband Charlie are expecting their first baby in March of 2019! Jen will be on leave starting in mid-February. The entire SkyLaw team is attending an off-site retreat with the theme, “What on Earth Will We Do When Jen Is On Leave?” in order to prepare. We are very happy for her and look forward to expanding the SkyLaw family. 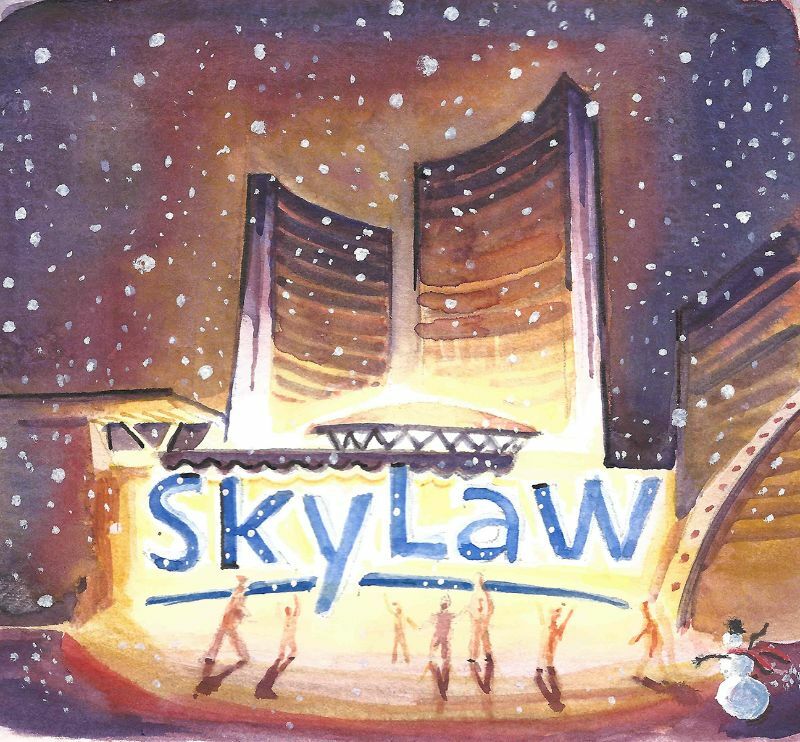 The SkyLaw team wishes you a very happy, healthy and successful 2019! JABUKA is an all new, totally twisted fun word game! 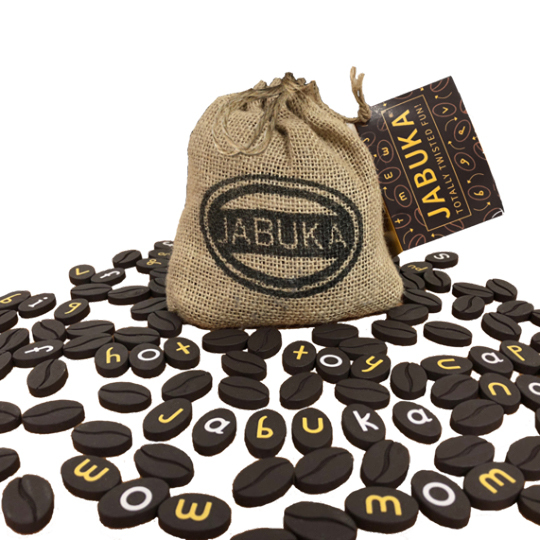 Any word game requires using your bean, but the way to win JABUKA is to use the most beans in a spontaneous, fast-paced race to be the most prolific wordsmith. And here’s the innovative twist: the coffee bean-shaped pieces with yellow characters can be turned to form different letters. For more info and rules, or to purchase the game, visit their website at www.jabukagames.com. Jabuka Games was co-founded by Warren Kotler and Martin Russocki. Martin is also a talented artist. SkyLaw commissioned him to create our 2018 holiday card. His original watercolour can be found hanging in our office and can be viewed in more detail here. For more information about Martin Russocki’s art, check out his portfolio at www.martinrussocki.com.